A play about a relationship between mothers and siblings, Natural Women explores the habits of love and heartbreak we learn from family. In a house overcast with clouds of met and unmet desires, the three children of a straying mother and cuckolded father navigate their relationship with each other, with ultimately tragic consequences. Taking crucial plot points from mythical Greek stories, the play recasts well known mythic characters -the web-spinning Ariadne, the naive and ultimately corrupted Phaedra, the monstrous Minotaur and the ever-heroic Theseus, as archetypes for contemporary characters working through the quandaries of the human heart. 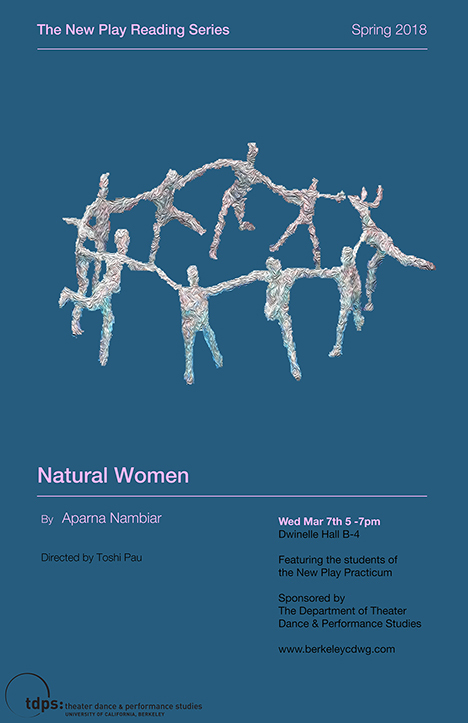 Join us for a free reading of the play Natural Women by Berkeley graduate student Aparna Nambiar, followed by a discussion with the playwright and Toshi Pau, the director. Presented by the Department of Theater, Dance, and Performance Studies.